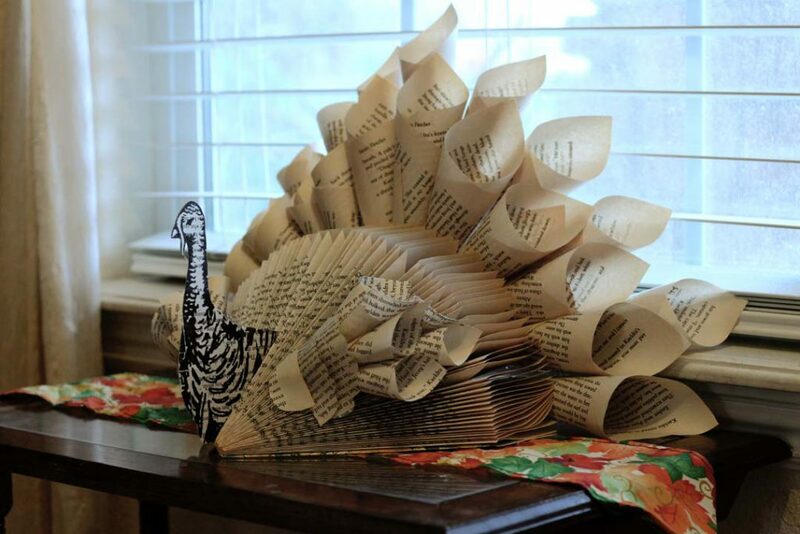 Make a unique, and easy decoration for your Thanksgiving celebration with an upcycled paperback book! To begin, use your X-Acto knife to cut about 24 pages from the back of the book – set aside for later. Open your book to the first page, and fold the top right corner down to meet the spine. Crease firmly. Continue folding the entire book this way. You can either leave the covers unfolded, or fold them as well – I folded my covers and tacked them down with hot glue to secure them in place. To download the Turkey Head PDF, click here. To make the head/body, you can go one of two ways: You can print the PDF on just plain paper, or you can print them directly onto some of book pages you cut out in the beginning. To print onto book pages, tape 2 pages to the center of a plain sheet of printer paper, don’t let the tape stick out over the edge of the printer paper, and print your turkey head/body onto book pages. Fold the turkey on the dotted line, making sure the turkeys are aligned by holding up to a window or light so you can see through the paper. Use your glue stick to glue the layers together. Cut out. To make the tail feathers, use the pages you cut out when you started. Position a page in front of you, long sides vertical. Begin rolling the page into a cone along one of the long edges. Apply gluestick to hold in place. Repeat with all but three pages – save three to make wings. Glue one row of cones along the flat folded edges of your book, pointed side down–glue in an arc, placing the rolled pages higher in the middle of the body, and lower as you move to each side. Glue a second layer of cones, so they stick higher up, onto the front row. Glue the head into the middle of the turkey body. To make wings, take the last three cut pages, fold in quarters, and then cut into quarters using your folded lines. Roll each quarter into a cone, just like you did the tail feathers. Glue two wing cones together, then glue another on top, in the middle of the first two. Repeat – make 3 more sets of 3. Glue two sets of 3 together along the flat side of the stack. You’ve now made one wing – glue the remaining cone stacks together the same way to form the second wing. Glue the wings onto either side of the turkey body. If desired, cut some scalloped half-circles to hide the pointed edges of the wings. Looking at your turkey from the front, straight down the head, it should look like this. This entry was posted in Thanksgiving and tagged book folding art, DIY Thanksgiving, paperback turkey, turkey on November 21, 2017 by Michelle. Cool! A nice variation on an overused Thanksgiving theme. I quite like it. How many pages do the book has to have to make it full like yours? Just simply love this!